I can always count on a certain radio station to play the same Christmas songs over and over, year after year. It's not as nauseating as it sounds; Mariah Carey's "All I Want for Christmas is You" has become more of a seasonal expectation now. When I sing along, I'm pretty sure I sound like her. 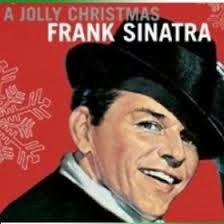 It's even hard to tell whose voice is whose on certain parts - especially the beginning: "I-i-uhh-uhh-aye...don't wanna lot foh-orrr Christmasss..."
But nothing beats Frank Sinatra's "Frosted Window Panes," correctly called "The Christmas Waltz." Either name does it for me, for they both invoke feelings of wintry coziness and glee. And I'm no musician (just an amazing Mariah Carey-esque vocalist), but the pace and phrasing of that one part - "and this song of mine in three quarter time" - is genius. Actually, the only song that could possibly top "The Christmas Waltz" - or even come close - is "O Holy Night." It's ALL in there. Everything you need to know about frosted window panes, candles gleaming inside, and painted candy canes on the tree is basically found in "O Holy Night." And that's not all! The song continues on, speaking of how his "law" is now love and his gospel is peace. The whole song - both music and lyrics - is gloriously epic. And that, my friends, is why we celebrate this time of year. A time when HOPE finally waltzed (Christmas-waltzed!) into the world, changing everything.